We take a look at the bizarre but brilliant trend that’s sweeping the world: hamster wheels for humans! Have you ever peered inside a hamster cage, looked at a hamster running around in a wheel and thought to yourself “Actually, that looks kinda fun”? Hamster wheels have long since represented a symbol of futility, cyclicality and even animal ignorance to the artistically (pretentiously) minded, so it’s unsurprising that they’ve found their way into a great many artworks over the years. New York artist Alex Schweder recently took it upon himself to live inside a 25-foot wood and steel hamster wheel for ten days, in order to ‘highlight our independence’. 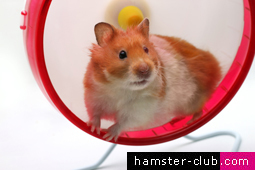 Ever since hamster wheels first attained widespread popularity in the 1940s, they have offered hamsters and other rodents the means to exercise properly, regardless of the size of their cage. Running in a wheel is essentially the ultimate hamster workout, and running wheels are just as well suited to the fitness-boosting needs of adventurous humans too! A treadmill operates on a basically identical principle to a hamster wheel anyway, so if you want to keep fit at home, why not make an outlandish statement with a human wheel! ?